Paul Avril's Clos des Papes, 2008, is a red Châteauneuf-du-Pape which is a rich, dark coloured wine with a bouquet of lavender, kirsch, licorice, loamy balsamic notes and hints of roasted meats and herbs. This is a Grenache (65%) dominated wine with 20% Mourvedre, 10% Syrah and smaller quantities of other permitted varieties forming a quintessential Châteauneuf red blend. Since 2010 viticulture at Clos des Papes has been certified organic. An elegant wine despite its high alcohol content with excellent density and richness, the 2005 vintage of this wine was The Wine Spectator's Wine of the Year and this vintage is of a very similar, high standard, albeit somewhat lighter in style, which we feel is certain to impress fans of this appellation's red wines. 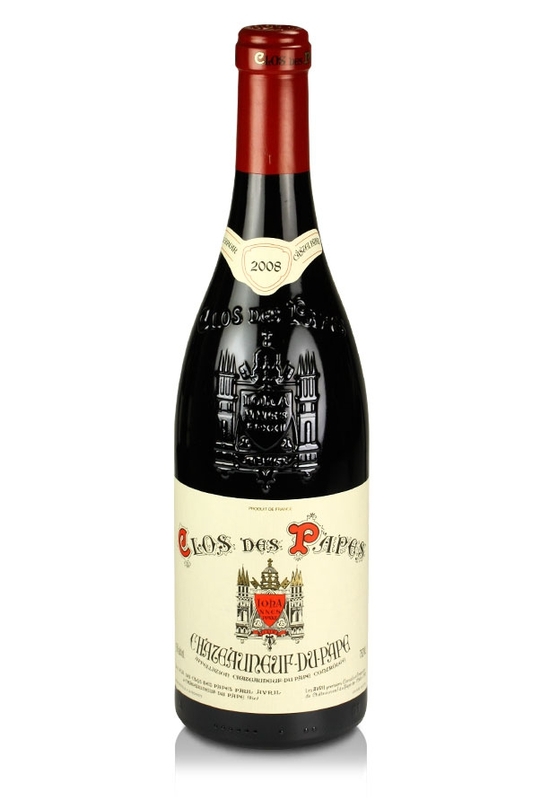 Paul Avril's Clos des Papes has long been one of the great estates in Châteauneuf-du-Pape. The estate's history starts in the 1700s but actual winemaking only began towards the end of the 19th Century. All wines here are aged in old wooden foudres for 15 months or so and the result is spectacular wines which tend to be the benchmarks for any long-living Châteauneuf-du-Pape reds.